Gorgeous blue/green fire labradorites with kyanite, green torumaline and sapphire gemstones set in oxidised and polished fine and sterling silver. 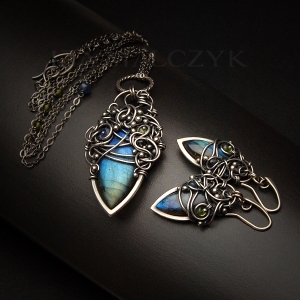 The pendant is 6,5cm long and 3cm wide. The chain is 65cm long plus 10cm of extension. The earrings are 4,8cm long and 1,9cm wide.